Fort Smith Stylista: Meeting Trina ! Our meet-up was some months in the planning, with false starts and bad weather spoilers, but it finally happened. Last Sunday evening, I got to meet the completely lovely Trina, owner of her very popular blog Tea Time With Trina . She and her charming and romantic husband were in Northwest Arkansas for business, and we met up at our favorite PF Chang's China Bistro. Dan and I were late, of course, and it was my fault (more about that to follow ...) but we found them waiting patiently in our reserved favorite booth. So nice! Trina is even more lovely than in her blog photos. She is as delicate, and her features even prettier and her open smile more welcoming than you can tell from her blog. But, until you meet her in person, you really can't appreciate what seems to me her lovely core of serenity and calm. She has an attentive quiet that is madly attractive. She is interested and interesting, and that always makes for good conversation. 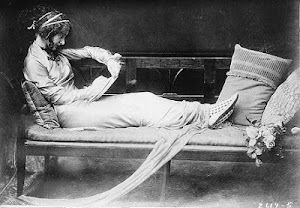 And she has the best natural posture of anyone I've ever met. She doesn't show off and go on about the use of chopsticks (like some short persons present at the table) and I don't think she even had seconds (unlike the rest of us. Some had thirds ... "Go, Dan!") Trina is wonderful, and it was my great pleasure to meet her and the equally wonderful Mr. T (he has a name, but I'm not sure they want it public, so I'll just punt.) We hope to see them again soon, as Mr. T is often in the area and Trina joins him. How cool is that? 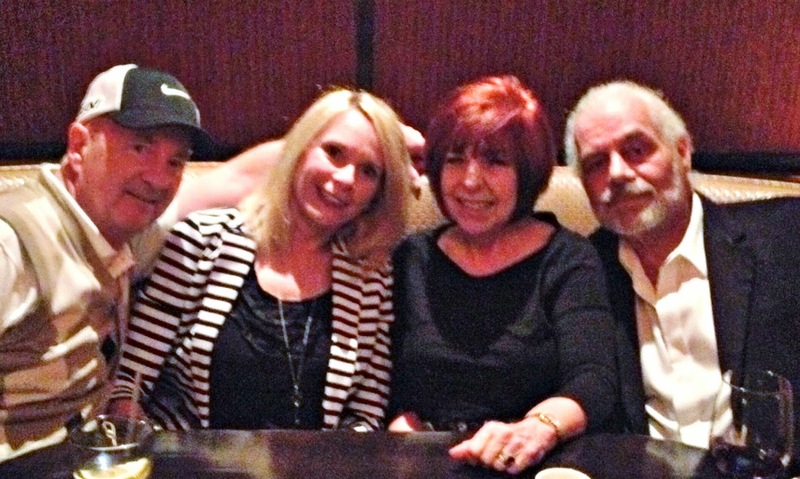 We were almost the last diners to leave, and we thoroughly enjoyed our evening. Neither Dan or I could manage our camera ( we've never used it with the flash! Duh ...) so Trina sweetly sent me a couple of photos to plug in here. Thank you, Trina, for keepsakes of a lovely and memorable evening! ... and one with our fellas. We were only about 10 minutes late, but it was my fault because we squeezed in a quick stop at the big Northwest Arkansas Mall. It took just a tad longer than I planned. I don't get there often, and it was a great treat. I've been pining for a pair of red, ankle strap d'Orsay pumps, but haven't found any yet. I did, however, fall hard for a buttery soft pair in a deep pinky-coral at Aldo. The price was right, and as they didn't have my size but offered free shipping, that took a little extra time to arrange. Late, but for a good reason: great shoes. Although I don't have them in my possession yet, here's a picture of The Pump That Made Me Late for Dinner with Trina. Not quite, but almost red. It was too rainy and windy to photograph on Sunday, so here's a re-creation of what I wore to dinner. This skirt is the second I've made, and I am in love with this Chinese brocade. The swirling dragons and pheasants are rendered in metallic gold, light red and light green embroidery. So pretty. Not a summery fabric, but I'll wear it anyway with lighter weight tops. I'm very happy with the way it turned out. Next, a more casual, summery print maybe? I'm currently a one trick pony with this pattern, but it's precisely the shape I want, and that's the best reason to do it myself. The exposure in the photo below is stranger still, but I wanted you to get a better look at the brocade. You can see the black-on-black blossoms woven into the background more clearly. I just had the best day! Thank you, Trina, for all the travel time ... I'm so happy to have met you at last! Please pop over to the wonderful blog of one of our favorite fellow-bloggers at Terry's Two Cents . He was kind enough to feature me among some of his favorite "likes" of the week, and I'm among some stylin' company! Thank you so much, Terry! Your skirt is amazing! I love the fabric - I'll bet your new shoes will be the perfect accessory - and it isn't hard to see why you chose that shape. I hope you make more and grace us with them in your warmer weather looks. OH, OH, OH!!! How wonderful to see two of my favourite bloggers together! I feel as though I know Trina better through your description of her! Thank you Jan! 10 minutes late for shoes...I'd totally forgive you for that, hahaha! They are adorable...maybe a wee bit high for me, but I think I will check them out. Aldo's is the one shoe company I buy online from. For me; a very convenient return policy as there is a retail outlet in my neighbourhood! Your skirt is lovely, lovely, lovely Jan! And the more I sew, the more I realize that there is no shame in using tried and true patterns over and over! In fact, I recommend it!! Now that is fun Jan! How great to meet Trina. I love your story about the shoes. Your a true fashion gal aren't you! I always thought Trina would have in person an engaging way. I love your skirt and boy i could see the shoes you ordered with it! How sweet that you and Trina met! The two of you look very happy, and I'm sure there was much to talk about. Blogger meet-ups are like that! Love the photo of the four of you. 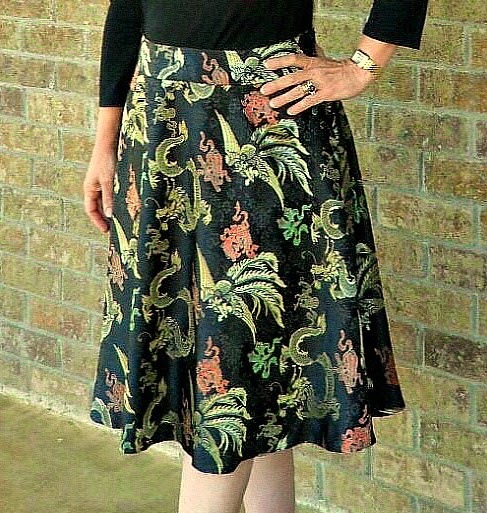 I'm very impressed that you made the gorgeous brocade skirt! Jan, you have so many talents. In addition, of course, to your taste in shoes. What a blast! So many bloggers are having meet-ups in real life lately. You look like you had a good time. I'm sure she was understanding about being late due to shoe shopping LOL If anyone would it would be a fellow fashion blogger. That's great that you two were able to meet up. I've enjoyed Trina's blog and she seems like such a sweet person. My friend has those Aldo pumps and I was drooling over them and sort of forgotten about them until now. The color is gorgeous and will look with this pretty new skirt that you just sewed! Gorgeous skirt and so impressed with your skills! It looks like you had a wonderful time! I think finding a skirt pattern you like and making it in a variety of fabrics is a great idea and something I am always intending to do. The style of that skirt is so pretty and looks great on you and you have found some fantastic fabric. Those pumps are gorgeous but I would never be able to walk in them. Not that I do much walking anyhow. I so wish to meet you one day. Two lovely bloggers together, no doubt a great time was had by all. Ten minutes late for finding wonderful new shoes, I,m sure you were forgiven by Trina. Beautiful fabric in your new skirt, so baroque , keep sewing, you clever girl. Blogger meet-ups are always a joy! How lovely that you and Dan had such a great evening with Trina and her husband, love the photos. You lucky girl! Those shoes are stunning and make me green with envy, wish I could pursue those heels! I love the look, the skirt is very flattering on you, looking fab! Love the shoes and the skirt! I can quilt, but I've never made clothing. I may need a lesson from you....because I LOVE the skirt! Ooh, I had not heard of Trina's blog before now. I can't wait to check it out. I don't blame you for reusing that pattern in the slightest --the length and silhouette are perfect on you. What gorgeous material you selected for it! Two of my fav bloggers together! Adorable, stylish ladies! Meeting fellow bloggers is always so rewarding. Two wonderful ladies together, that's fabulous!! You look great in your skirt and heels. Aww, so cool that you got to meet up! Your skirt highlights your great figure so well. I have to say that your hair is looking rather spunky in these photos too. You have a great eye for what works for you - whether it's hair, clothing silhouettes or color. first of all congrats to your skirt! It has the perfect style, the perfect length and is cute all over. I see you had much fun. Isn't it wonderful when blogger world meets real life? We share so many ideas and time together and therefore know each other from the beginning. I have the chance to meet a blogger friend on Friday as well. She Nelja comes with her hubby to visit . I am looking forward to them. Although she stopped blogging some month ago we are in contact. Oh you sweet and kind lady. Let me tell you, meeting you in person was so worth the long wait. You are the most spunky, fun, energetic and lovely lady I've ever had the pleasure of meeting. I'm definitely trying your homemade facial treatment as soon as I get home, if it will promise to make my skin glow like yours does. Seriously, you have the most beautiful facial features and that gorgeous hair of yours, WOW! 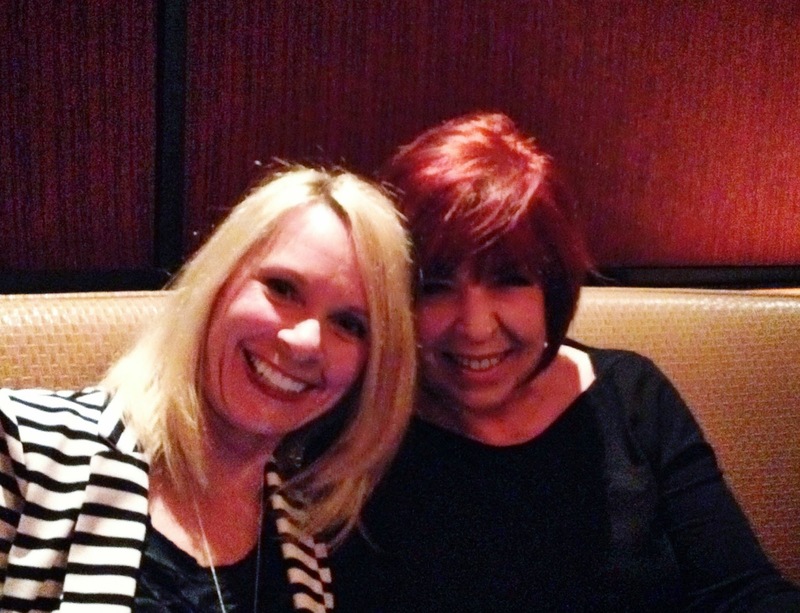 I am still pinching myself that we were able to have such a lovely evening, you are one fun and entertaining lady. Now for the other readers, Jan's skirt is even more beautiful in person. The material is absolutely breathtaking and she wears it with the confidence that it deserves. I'm so thrilled to have a bit of this fantastic material in my hands, many many thanks, but that's for my posts (to come when I return home). I adore your handmade skirt - its beautiful and a perfect fit. Thank you, Natalia. I had so much, fun, and I'm glad Trina did too. And I'm glad you liked my skirt. We're so rural here that there's very little selection even in the nearest city of any size, so I have to use a lot of ingenuity. I get so tired of having to wait for such a long time to be able to try new ideas. There are lots of gathered skirts in maxi lengths that I could just shorten, but I don't wear gathers very well or happy. And since silhouettes are not so complicated right now, I'm trying my hand at sewing again. So glad you stopped by! It's always nice to hear from you. Thank you, Sharon! I never like pics of me, and I'm not nuts about how I look in these, but I sure do treasure the image of the experience. It was lots of fun, and well might happen again as Trina gets around! Really! Trina may well be back in this territory before too long. We should make some plans. This could be the best meet-up. Lets try! I'm really proud of my skirts. Perhaps a couple more in different fabrics and a print or two. I Love how they look, and will like them with differently cut shirts in summer. I'm wanting a box pleated one, which may be more difficult to fit, but I love this retro-New Look iteration. It's problematic for short, wide women, but I figure if I start from scratch, I might have a shot at making it work as well as possible. I'm just determined. 'Dunno about any grace involved, but you'll surely see what I come up with! We did! And we may get to do it again soon, so I have that to look forward to! Those black heels are among the most comfortable I own. They're very soft leather, and I'll spend more for that if I have it. As you say, "it's shoes" and that really does say it all, doesn't it? So pleased you dropped by! Thanks so much, Lenya. Hey, Sue! We had a lovely time, and Trina is really living proof that pretty on the inside makes for pretty on the outside. Great girl! She didn't bat an eye that I was so late ... actually, since our drive was 1.5 hours and there was some serious weather, I'm surprised we weren't later. I'd made reservations so they could sit and be comfy if we were late. Poor Dan, to his credit, didn't freak too much ... just gritted his teeth and smiled for his dopey wife. He hates being too late. I'm still getting that pattern down, and will use it at least once more. As Pao said, the more varied the fabric, the more different each iteration will look. And no one but you guys who read this will ever know! I'm actually going to take a quick seminar at out fabric store about pattern-making. I don't see myself making my own patterns, but it might give me clues as to fitting patterns more effectively. It's toward the end of the month, and I'll let you know how it went! Thank you, Sweet Sue, for stopping by, and for all the ecouragement! That skirt is drop dead gorgeous! And I can see why those shoes made you late for dinner....How fun to meet up in real life with another blogger! I would love that! I was so jealous when I read you two met up. I so wanted to be there. I have "known" Trina longer than I have known you (although my love for you is equally big haha). The skirt: because the fabric is different each time, you can get away with being a one trick pony (LOL) for a while. Indeed beautiful fabric. The skirt looks good on you with the black top and the black shoes. Still waiting for the shoes to arrive ... won't be thrilled until they're actually here. Free shipping is slow, invariably. I just wish they'd stock more shoes in 6.5! Trina is lovely, and it was such a treat to connect. Wish I could meet all my bloggy friends, you especially. Thanks so much for your sweet remarks and for dropping by! Thank you, Judith, so much. Especially for stopping by. I'm always so happy when you do. Yes we had a fabulous time. Someday we might get to Westminster, and we'd surely look you up, too. Hope you are enjoying your travels! This seems like the season for meet ups! Yes, she was a massive good sport. And a completely charming lady. Thanks for liking my skirt and for all your kind comments. I so appreciate it when you come by for a visit. They might well be gorgeous, but I can't be sure because they haven't arrived yet. Won't be here 'til next week. Free shipping is all well and good, but sending it by pack mule is less expeditious than I'd like. Amazon has spoiled me rotten. Thanks for all, Alice ... the sewing is a challenge, but I'm picking up new skills! Glad you like the outcome! Thank you so much, Linda! I'm so pleased that you thought of me for the Liebster. I'm just out of interesting trivia stuff about myself to offer! So please forgive me if I give this one a reluctant pass ... I need another year to develop some interesting things to talk about! Love your blog and your positive approach to everything. And you are just the cutest girl! Yes, it was fun and an absolutely memorable evening. I like those! Thank you, Shawna for your very sweet notes, and for thinking my clone skirts are a good idea. I love them, but gathered skirts don't work as well for me and pleated skirts are either great or awful for me. This little A-line circle skirt does pretty well. I'm shopping for more fabric on Wednesday ... our day to go to the Big City! The little pumps are yummy, but tallish, I agree. The trade-off that I think will make them wearable is the very soft toe box, fabric and padding. Besides ... this style will allow me to hack off up to 1/2" of stiletto, re-cap the heel and go. I probably won't, but it's nice to know I can have it done. When I win the lottery, Sacramento, I'm coming to visit you! Someday, I hope! You are the skirt queen, and I think of you often when I'm looking for fabrics. So happy you like it ... that means a lot to me! Thank you, Your Majesty! We did have a lovely time, Jill. Trina was so kind. I'm looking forward to producing another clone of my skirt for summer, or two. Glad you like them, 'cause I like your taste! Thank you for dropping by with nice things to say! Yep, this was my first. So fun, and glad to repeat the experience anytime. I'm so going to get to see you guys over there one day. I mean it. You know, I remember telling you once that I was not as obsessive about shoes as I seem. And when I don't like the current wave of design, I'm just differently obsessed by finding ways of finding shoes that work. This year, I love these ankle strap little dudes and have to admit that it's really all about the shoes this summer. There's an element of unhealthy stubbornness to it in my case, but Dan is feeling better about the whole thing because he realizes I'll run out of colors to stalk. I was wrong, and you nailed it on the head. Going fabric shopping on Wednesday. I need a floral or heavily abstracted art print. You're so kind ... and patient. I'm late, but I generally get there! Thank you for all you lovely words, Curtise. I appreciate it. I think I'm going to be impressed when I actually get them! So slow, their free shipping. I'm spoiled by Amazon shipping, I guess. Thank you. I thought of you when I saw that opulent fabric the first time! I wondered if I could carry it off as well as you do those really rich fabrics and patterns. Thank you for the sweet remarks, and for the inspiration! Thank you, Britt! So kind of you. Still waiting for them to arrive. Amazon has spoiled me with their lightning fast shipping. The skirt was easy. Well, easy-ish ... I want to make at least one more, very casual one for summer ... maybe two more clones. It's a great skirt for short waisted girls. And yes, I was shoe-detained. Always unavoidable, that. Trina was a great sport and really good company! So glad you stopped by, Pao. Glad always to see you out and about. I'm not sure whether I should have admitted to the lateness-caused-by-shopping. In my own defense, I was driving in an unfamiliar area, and there was a great storm on the way up and ... well, yeah, I did stop to buy shoes. Perhaps not my best moment, but if I waited until I did well, I'd never have anything to write about. Sad. Glad you liked my skirt ... I'm thinking of summery prints now ... trying to figure out how to wear a huge, slashy art print or perhaps florals, then where to find them! So happy you stopped by. Thank your for such nice words, too! Yup ... Trina's place always has some pretty pieces and thoughts. Thouroughly nice lady, and always chic as can be. Glad you like my skirt ... I'm thinking about prints and want some abstracted art prints to see if I can manage the proportions. Not much to choose from here, though. Might well find the floral I'm looking for though. Regardless, all you guys who stop by will surely get to see them! Awwh. Thank you, Dawn Lucy. I appreciate you putting me in that company! Trina is as classy as the day is long, and looks amazing. Sweet lady, too. Thank you, Annette. I often think of your ability to dress yourself so beautifully, and hope you know the inspiration you provide! Trina is another one I watch, and it was so fun to meet her. Never hurts that dinner was involved! Thank you, Lovely Alison! From you, high compliments. Just cut my hair again ... hope you like it as well. I just can't do the bob thing. Not for me at all. I'm liking an adjusted proportion with a long pixie and my short frame. I sure hope you're right! It seems like this is the season for blogger meet-ups! Hope you enjoyed your visit with Nelja. You are so right ... we're not strangers when we meet for the first time. Nice! Glad you like the shoes! They haven't arrived yet, so I can't be sure, but I have high hopes! So happy you stopped by, Sabine! Darling girl! I'm already looking forward to seeing you again. Also glad you kids like to do food ... always a great excuse to eat something wonderful! I'm overwhelmed with your praise, and glad you had fun, 'cause I sure did. Par is one lucky guy, and he's fabulous company, too! I'm happy you had a lovely Easter, and I'm so glad we met. More, please! Yes, I get it, and wish I were that! Just a beginner, but having lots of fun! 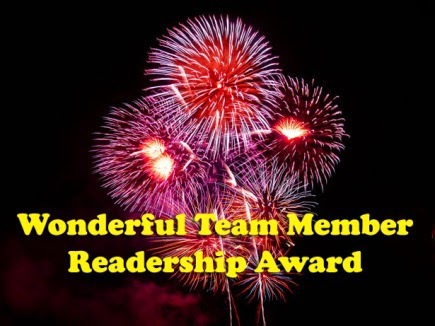 *** I nominated you for the Wonderful Team Readership Award ... yes, it's a thing! But you don't have to come up with 27 things about yourself, so it's less difficult the 4th time around! Thank you, Che! Hope you had a lovely Easter, yourself! Yes, shoes are the subject of a lot of my dreams and a nightmare or two. Worth all the trouble and expense, I think! Thank you, Vix! I'm always tickled when you like something of mine. You're accomplished at the sewing machine ... so if your eye picks up something that I need to do better, please speak up and tell me how to fix it. I'm so pleased to get to meet one of you. I'm getting over the Pond someday if it kills me. I'll come visiting before I check out rather than after, so no worries! Trina has the most beautiful blog. And Terry is one of the rare guys who really get what makes a woman's look work. Both are bloggy treasures! Glad you liked the introductions. Thanks, Catherine, for all! Thank you, Janise! So nice of you to drop by and say such nice things. I'm pleased with my skirt, so thank you. I'm looking forward to wearing it with a summer top. Hope you get a chance to visit Trina ... she has the most amazing blog! Hey! Thank you, Debbie! We had lots of fun and may do it again! I've nominated you for a Wonderful Team Readership Award ... hope you have fun with it, 'cause you're a valued reader! Thanks, Darlene! I'm lucky to be just nearsighted, but that's still okay for sewing. I'm glad you like my skirt ... I'm very pleased with the way it turned out! Oh, yes ... so much fun, and we might get to do it again before long. Perhaps we'll do Italian this time (It's always food for me. Always!) So happy, too, that you like my skirt ... oh, Inspiration Goddess of the Sewing Machine! I've nominated you for a Wonderful Team Readership Award ... it's not one you have to figure out a bunch of personal factoids ... its about your fabulousness as a great reader! How fun would that have been! There would be no stopping us! Thank you for all the nice thoughts about my skirt. How awful would it have been if nobody liked it after all that work! I've nominated you for a Wonderful Team Readership Award ... it's not one you have to figure out a bunch of personal trivia to list. It's because you are one of the coolest readers I know, and I always look forward to hearing from you! Thank you, Lenya! Hope yours was lovely as well! Gee... I am flattered. Look at me!! Everybody! It remains a strange thing... the connection you can feel although being so far apart and only through this medium. As my husband always says: ask not how, just enjoy (it sounds so much better in Dutch as it rhyms).